Fungal infections are caused by a number of fungi that attack different areas of the body, externally and internally. According to the book "1000 Cures for 200 Ailments," some fungal infections respond well to topical treatment, while others require oral prescriptions. If you have a serious fungal infection that isn't responding to your current treatment, talk to your doctor. 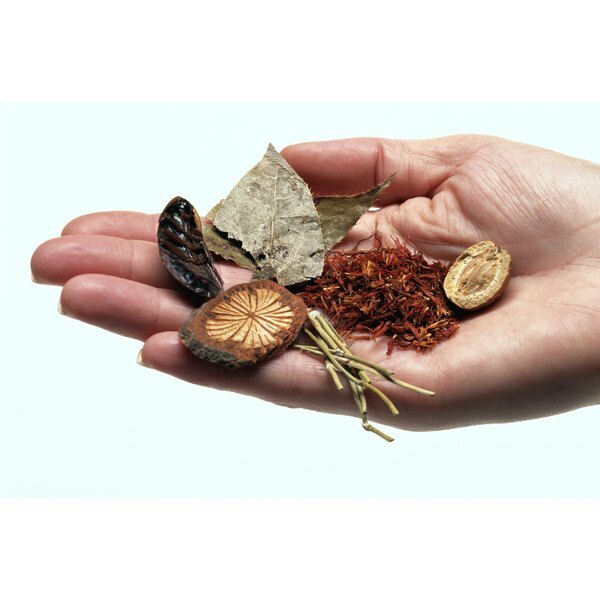 For less serious fungal infections, natural, herbal remedies have been shown to help. Garlic is a fantastic immune-system booster. According to the "Physician's Desk Reference for Herbal Medicines," garlic taken orally is antiviral and antibacterial. It also causes your body to create more natural killer cells to attack foreign invaders. So adding extra garlic to your food or taking garlic tablets is advisable in the case of fungal infection. But garlic also contains a compound called ajoene, which is as powerful as standard topical antifungal creams, according to a study published in the September issue of "Revista Iberoamericana de Micologia." While you could crush garlic and make a poultice to put on the area of infection, a cream made from the extract ajoene can provide the same benefits with no smell. Apply it directly to the area of infection twice a day for seven to 10 days. Tea made from the bark of the Tabebuia Avellanedae tree native to South America has reported antifungal properties, and in "1000 Cures for 200 Ailments," Dr. Geovanni Espinosa suggests that you drink two cups a day for the maximum benefit. Rice vinegar is a treatment specifically for infected finger nails. When fungus infects fingernails, it separates the nail from the nail bed and grows a thick white crust. In "1000 Cures for 200 Ailments," traditional Chinese medicine expert Dr. Zhuoling Ren advises that you soak your infected nails two to three times a day in rice vinegar, scraping the damaged nail material away with a towel after each soaking. This procedure will allow the finger to eventually heal itself. Tea tree oil is very commonly used for skin conditions. The "Physician's Desk Reference for Herbal Medicines" cites a study published in the 1996 issue of the "American Journal of Infection Control" that found that tea tree oil acted as a fungicide against Malassezia furfur, the fungus that causes pityriasis versicolor, folliculitis, intertrigo, seborrheic dermatitis and dandruff. Tea tree oil has also been proven effective against a number of dermatophytes and yeasts. In "1000 Cures for 200 Ailments," herbal expert Dr. David Kiefer suggests you apply a solution or cream of 25 to 100 percent tea tree oil to the affected area two to three times a day.